As followers of my Twitter feed will know, I spent much of last week at the first Defence Heritage Conference, splendidly organised by Wessex Institute of Technology and held at the Royal Beach Hotel in Portsmouth. This proved to be an excellent event with some great networking and interesting papers, ranging geographically from Taiwan to South Carolina and Australia to Trondheim via detours to Lithuanian forts and the palace of the Deys at Algiers. My own paper, on the first fifteen years of the Naval Dockyards Society, was the first on the conference schedule and seemed to go down well, although I’m not entirely certain whether this was because of my delivery or whether, at just after 9 in the morning, the audience was still half asleep. Several papers got me thinking about some of my own concerns: for example, there were some insights that will be useful to me for Britannia’s Dragon, and many others relevant to me as chairman of the NDS. As far as the latter is concerned, the most important was the question of to what extent can we or should we preserve the larger survivals of our naval heritage, both ashore and afloat. One paper that really got me thinking about this was given by a Belgian speaker who was talking about the 19th century campaign to preserve some of Antwerp’s historic 16th century fortifications, notably two impressive city gates. Although the campaign had influential support, it struggled against a widespread perception that the fortifications represented a history of foreign occupation and oppression – very similar to the attitude in some former colonies to the military heritage of the British empire. There was even a widely supported petition in favour of the demolition, which duly went ahead. But 19th century Belgians – and Britons, too – also understood ‘heritage preservation’ differently to us. We would probably demand nothing less than the physical preservation of the gates, but in Antwerp the compromise of assembling a detailed photographic record was widely acceptable. We are clearly more sentimental about preserving the actual physical objects than the Victorians were (witness how they ripped out the medieval hearts of so many churches to replace them with frequently ghastly ‘restorations’). But the Victorians, in turn, were less sentimental than some previous eras; the Elizabethans retained Drake’s Golden Hind as a tourist attraction, but so many visitors chipped away pieces of it as souvenirs that the ship slowly disappeared.1So there is no guarantee that future generations will agree with our priorities, or agree with us over what should be preserved. 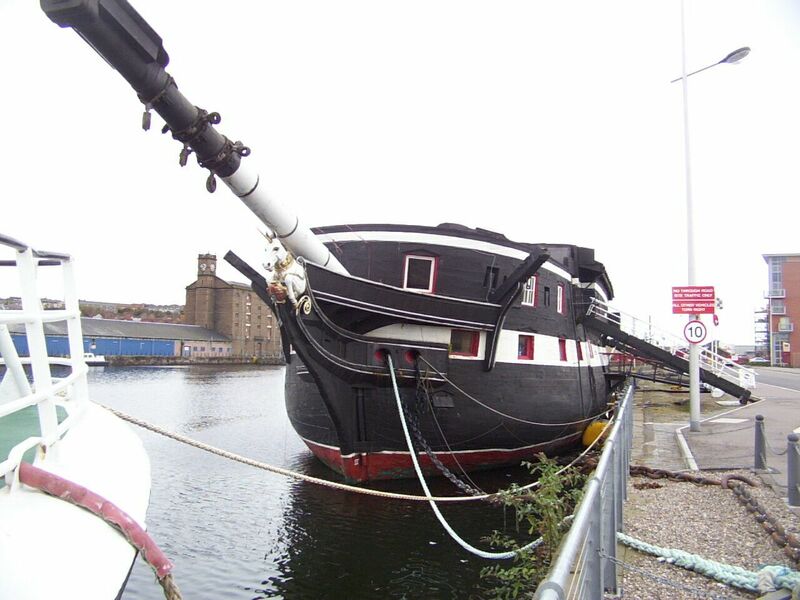 At the moment, for example, the NDS is opposing a planning application within the historic dockyard site at Sheerness which would see a historic and listed early 19th century mast house being demolished to make way for a wind turbine manufacturing facility. Is preserving the mast house intact more important than the jobs that the wind turbines might create? But then again, are those jobs in fact illusory, and will the wind turbine industry prove about as enduring as the Sinclair C5? A couple of other examples that have been in the news recently. HMS Caroline, the cruiser and last British survivor of Jutland, seems likely to be towed from Belfast to Portsmouth for preservation there, despite a growing campaign to keep her in Northern Ireland. 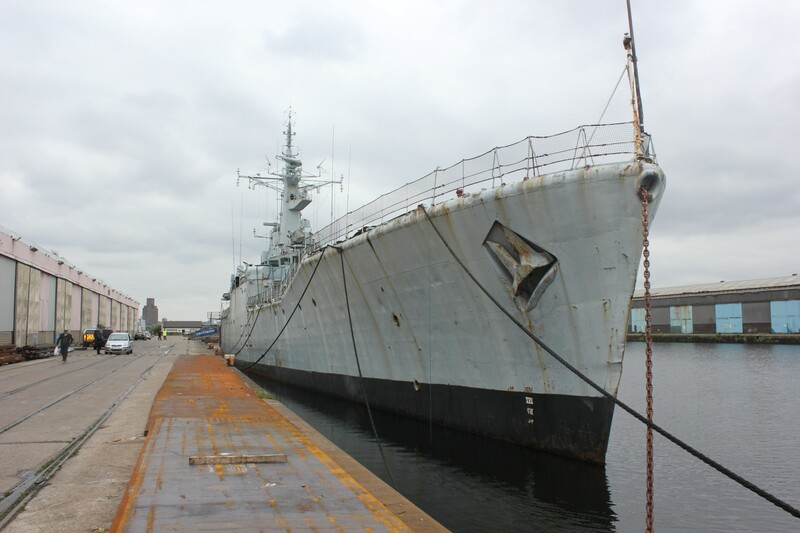 Meanwhile HMS Plymouth, which distinguished herself in the Falklands War, is likely to go for scrap despite repeated attempts to save her. The harsh truth is that many people would consider Caroline more ‘important’ than Plymouth, and it has a major organisation – the National Museum of the Royal Navy – behind the attempt to preserve it, whereas Plymouth is reliant primarily on volunteers, many of whom served on the ship and have an understandable sentimental attachment to it. Preserving a warship is a very expensive business, and rightly or wrongly, World War I and Jutland probably form a better long term ‘business case’ than the Falklands. It is all very well arguing that Plymouth or some other Cold War vessel represents a good example of a warship of a particular era, but that sort of reasoning is likely only to appeal to dedicated ‘warship buffs’; a general public largely ignorant of the sea and of the role of navies (partly because their knowledge is formed to a great extent by a stunningly ignorant media, such as the woeful bunch of incompetents that the BBC deployed for its coverage of the Jubilee river pageant2) needs a very strong ‘back story’ such as those presented by the Mary Rose, the Victory and – debatably – HMS Caroline. Because of the less sentimental attitudes of earlier ages, many of the ships that have survived to be preserved today have done so by pure chance, and that chance has thrown up some bizarre anomalies. Whole categories of warship have vanished entirely, yet we have two ships from the same nineteenth century frigate class, HMS Trincomalee and Unicorn, neither of which had distinguished service careers, which in geographical terms lie relatively close to each other (Hartlepool and Dundee), and, some might argue, which might well be competing for the same funding. In British naval heritage terms, the scuttling of Trafalgar survivor HMS Implacable in 1949 was a watershed: the slogan ‘never again’ was adopted, notably by the World Ship Trust, and the imperative to preserve historic warships grew. Admittedly, it was a slow process: as part of my research for Britannia’s Dragon I’ve read Admiralty documents of the 1960s which talk matter-of-factly about scrapping HMS Warrior, Britain’s first ironclad and now a major tourist attraction at Portsmouth, which was then in use as an oil fuel jetty in Milford Haven. Within just five to ten years, though, the attitude to the future of the ship changed markedly. But ultimately, just what are we ‘preserving’? Warrior is really just the bare iron hull – the ferocious looking guns are fibreglass, and most of the other fittings are modern replicas too. Only about 10% of HMS Victory is original; large areas of the ship are post-1922 reconstructions put in place to revert her to her Trafalgar appearance. In that sense Victory and other preserved warships like USS Constitution (of which roughly the same amount of the original structure survives) are at least partly pastiches, modern recreations of what we think (but cannot be entirely certain) the ship looked like at a particular point in its past, and even on the busiest day of the year for visitor numbers, they cannot hope to recreate the most important reality of any warship – that this impossibly small, cramped space was home to a large number of men, their smell, their noise and their belongings. Of course, most of the same issues apply to heritage preservation ashore too. Should buildings be preserved a la National Trust, as though frozen at a particular moment in time; allowed to fall into ruin; or be restored if already ruinous? For example, we had an interesting discussion at Portsmouth about the iconic dome at the Dounreay nuclear power plant. Is it actually feasible to preserve this at all, given its likely upkeep costs and remoteness? If not, should it be cleared or just allowed to fall down? Probably only one thing is certain: future generations will look at many of the decisions we have taken over heritage preservation, think ‘why on earth did they keep that but get rid of that?’, and curse us loudly for so doing. 1 There are different views about what happened to the Golden Hind – see here and here. 2 An honourable exception was Huw Edwards, who even corrected Simon Schama on a matter of historical fact – but then, Huw went to a good school! Terry Pratchett addressed this very issue in his book “The Fifth Elephant” where, while he addressed the Stone of Scone and other things he talks about the preservation of the past although things change… and because he did it so well I’m just going to quote him from the book directly. In this conversation, Samuel Vimes is discussing with the Low King of the dwarves the reality of the Dwarves relic the Scone of Stone, which is apparently still whole after hundreds of years, and the authenticity of which is the centre of a political crisis. Suddenly the King was holding his mining axe again. ‘This, milord, is my family’s axe. We have owned it for almost nine hundred years, see. Of course, sometimes it needed a new blade. And sometimes it has required a new handle, new designs on the metalwork, a little refreshing of the ornamentation . . . but is this not the ninehundred-year-old axe of my family? And because it has changed gently over time, it is still a pretty good axe, y’know. Pretty good. Will you tell me this is a fake too?’ He sat back again. Anyways.. I think that even if 10% of Victory is still original. but from when? When she was originally built? When she was rebuilt? or from Trafalgar? I think such things are relative..
I’m all for preserving heritage. But I sometimes think that if nothing was pulled down and replaced, we’d still be living in caves – or sailing in hollowed out tree trunks! It’s trying to second guess what the future thinks was worth saving that’s the problem.